Thanks for all the details. I learned something new today. 1. That pistol is gorgeous. There's beauty in the simplicity; there's none of the present-day faddish add-ons; and, best of all, it just plain works. 2. Your write-up has to be one of the best I've ever read. Clear, concise, with pictures galore to bolster your points. Simply excellent! What I find so absolutely perfect is that when the pistol came up for sale, fate arranged for it to come into the hands of someone who knows what it is and will appreciate it. You are one lucky fella. Go buy a couple of lottery tickets. Of course "luck" consists primarily of being prepared to take advantage of a situation. My congratulations, sir! Helluva find. 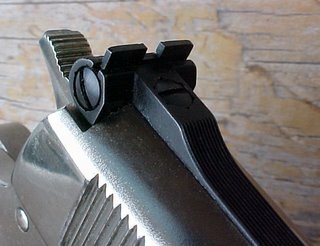 Having tried the extended slide stop on the Clark 1911, how do you like it compared to a standard slide release? As I had mentioned to you earlier, my wife liked the extended slide release on my Springfield Ultra-Compact 1911 so much that I'm going to have to put one on hers. It's simply much easier for her to push down than a standard release. Congratulations on a wonderful acquisition. 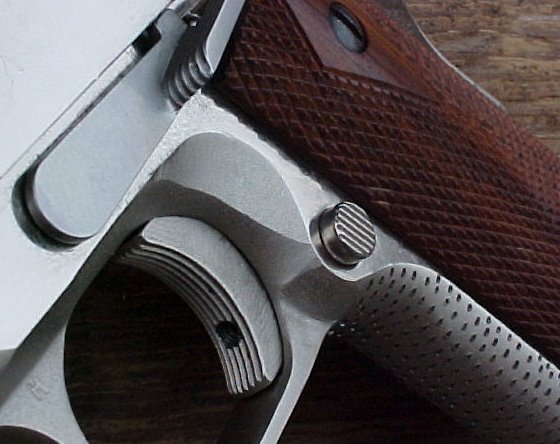 Sometimes I feel that we are simply caretakers, rather than owners, of firearms that are so beautifully crafted. Excellent piece. You still keep the most engaging gunny blog on the web. Great article lengths & photos! 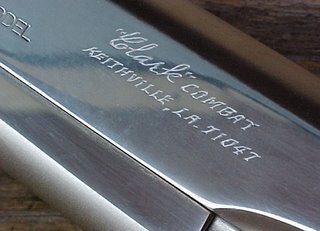 Beautiful gun...great article! You are in an exclusive fraternity now. Ps. How did anonymous at 8:32 get in here. Obviously a GFW. Fantastic gun and post. the gun dates from the time I was considdering an aprenticeship with a 'smith (i didn't take it). I used to marvel at the shiny custom guns with all of the extended extras, then i fell out of love with them, on the basis that John Browning knew exactly what he was doing with none snagging controls, and while it was possible to tighten up grouping and correct manufacturing tolerances with peening rails, nipping slides in a vice and building up with weld, it was often at the expense of increased sensitivity to crud. This gun might just have changed my mind. Looks like Anonymous is surfing the web from his U.N. office. Great blog by the way. And no, I don't have a sign-in. I still prefer the usual unextended slide release. I shoot with my thumb on top of the thumb safety. and as a result, it holds down the extended slide release, preventing lock back on the last shot. I'm not going to change the way I shoot. I don't want to change out this slide stop unless I can find a nickeled stop in good condition that will fit properly. That's going to be a tall order, so I guess I will learn tolive with it. Awwww .... I just drooled all down the front of my shirt. I like the stippling on the front strap, it looks like ostrich skin. Well written. One correction ... safety & slide stop are Safari Arms (not King). Nice gun and great commentary. In the operation of my Dad's manufacturing business he had occasion to have a few dozen parts machined from time to time by a contractor. At about age 15 I would go with him to pick up the parts at a small shop next to the Jersey Gold milk factory in Shreveport. I was fascinated by the other work being done in the shop. The machinist was working on guns, 1911-A1 pistols. The year was around 1956. The machinist was James E. Clark. 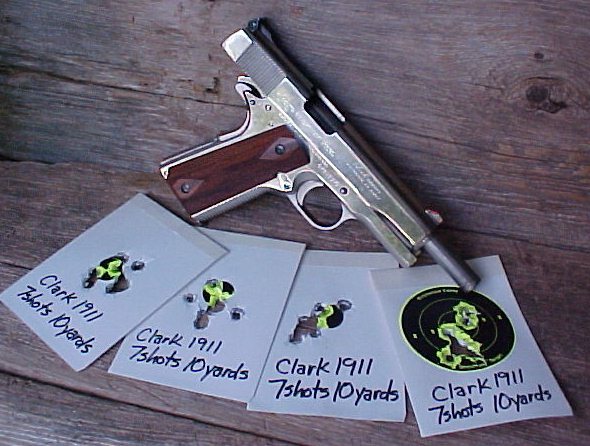 Jim Clark became my mentor for pistols, shooting, reloading and, unknown to most in the shooting industry, flying. He was like a father to me. I spent many, many hours with him learning all I could about pistols, revolvers and reloading. I used to watch him prepare, fixture, preheat and weld the end cut from a military slide to a Colt 38 Super slide as the beginning of the long heavy slide .38 midrange bullseye guns. He made barrels by drilling and reaming the cut off rear end of military barrels to accept six inch barrels machined from premium Douglas barrel blanks. He used an induction heater to silver solder the Douglas barrel into the prepared lock up stub. He had great success in providing winning guns to bullseye shooters with his five and six inch .38 Spl. wadcutter guns converted from .38 Super Colt 1911 guns. 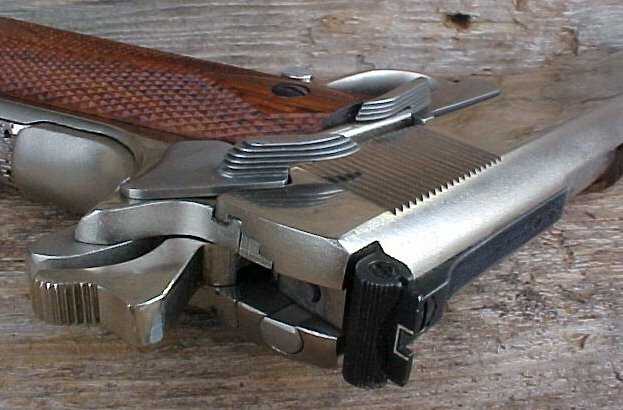 This success prompted the pistol industry manufacturers to bring out .38 Spl wadcutter bullseye guns. Clark Custom is now in Princeton, LA. Previously Clark was in Keithville, LA. My years of learning from Jim were previous to his Keithville operation. His shop was behind his home in far West Shreveport. I used to help him setup to perform his 10 shot 50 yard print test of these fine bullseye guns. On occasion we would print 10 shots to a 1 1/2" group at 50 yards from the Ransom rest. This was before he started using the Giles slide guide which helps machine rest printing. Jim Clark regularly urged me to consider taking up flying and I did. In 1975, with fresh commercial pilot license, I moved to Houston to fly for an industrial distributor. The last gun he made for me was a Colt 70 Series Commander compensated pin gun that is still in my sizable collection of 1911 guns. It's been lost, but I had the test target for years with the 10 shot 1 1/2" group from the 4 1/4" Commander. This may not be a place for a question, but I will try. How can I place a value on it ? Have Clark Custom Combat and would like to find out the approx value. Unfired and made in Keithville La. John, your pistol is probably worth somewhere in the neighborhood of $1200-$1500 depending on features and finish. That's a WAG, the real answer depends on what an interested collector will/can pay. Wonderful write up on Jim Clark and his creations.. I knew Jim when as a child I often visited the old original shops on Claiborne Ave, Shreveport, La.. My dad, Oscar A Hope was a friend and part time employee of Jim's in the 50s.. At the time it was a two man shop located within the city limits. I am amazed today as I think back to the days when Jim and my dad stepped outside the shop to test fire their handiwork, INSIDE the city and with impunity.. I recall lubeing freshly cast .45 wadcutters as my dad machined barrels from blank stock or ran parts through gross looking blueing tanks.. That bullet lube was thick and gooey, but I had hours of great fun in those shops..
As Jim became more well known and orders grew, he moved to larger more rural facilities. Jim and his wife Bernice were always wonderful to me through the years.. I highly treasure the friendship and memories of them. I have a 1911 that my dad located NIB back in the 60s. Jim took pity on this poor kid and after noticing the pistol had what he called a "soft slide" he pitched it casually into a junk box and took a NEW slide from a stock pile and fitted it to my pistol. 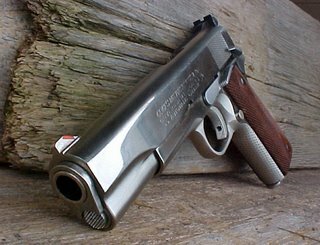 Later he installed sights, did a trigger job and did a beautiful blue job etc.. Later I had another World Class craftsman from Shreveport, E. C. Prudhomme, Master Engraver add my name to the slide of this 1911.. I now have the "touch" of two world class masters on this pistol.. It is surely my most prized firearm. Jim Passed away in 2000, a year and a half later we purchased his home and 12 acres in Keithville. We still live in the wonderful Log Home that Jim & Bernice built.. I am also a volunteer at the Fire Dept. that Jim organized and built, but that is another story..Now I want to go watch the old 8mm films from those days at the shop and with his airplane We are constantly reminded and surrounded by Jim's memory and legacy.. I just purchased a Colt Series 80 Gold Cup that had the Clark Accurizing Job. I called Clark Custom, and they told me what went into the accurizing job. It has Clark's name on it and the original receipt. The acc job was $400.00 in 1993$$$$. The gun is very accurate. I also own a full size Nighthawk Predator, and the Gold Cup is every bit as accurate as the predator, and I LOVE my predator. The slide to frame fit is adjustable, since Clark modded the frame a bit, and the fit can be adjusted so there is no play. The barrel to frame fit is very tight, and the trigger is a beautiful 3lb. It also has a Clark Hammer, Clark Sear and Clark Sear Spring. I don't have a pic of it yet, though. I was wondering if you use bullet lube on all your gun barrels and if that would make any difference in their performance?